It’s true. We are a bakery in New York City and only have so much space for everything we need to get our jobs done. So for us it’s all about organization. When a cake goes out of our bakery it is “finished” in every sense of the way. This includes the board the cake sits on. We don’t just leave the edges plain; we cover the edges in ribbon. It finishes the complete look of the cake. The question is, where do we keep all of that ribbon? 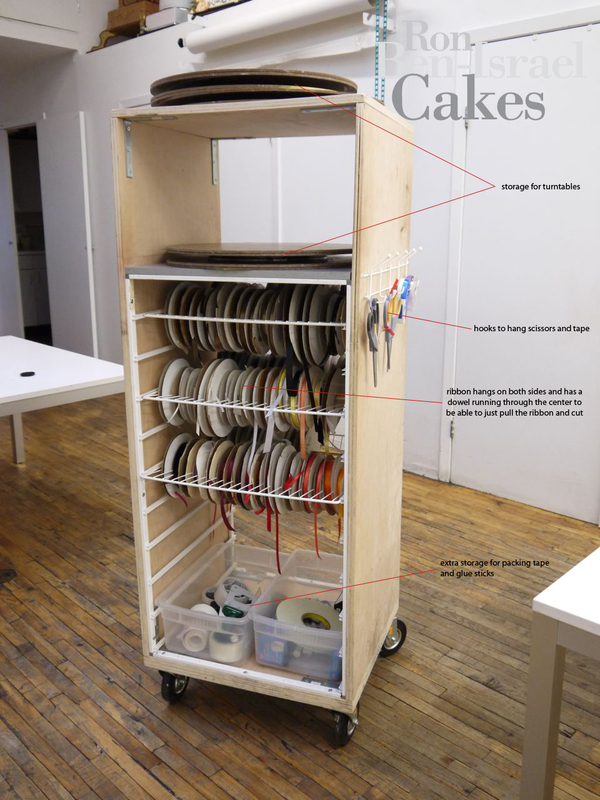 Our head chef Jeffrey made us a fancy ribbon cart that we can store in the closet and roll out to the worktables. Having something like this streamlines one little part of our process. But when you are organized in what you do, it allows you to focus on the bigger things. Here she is, our prized ribbon cart! Compact living! We know all about it – we have 48 square meters.